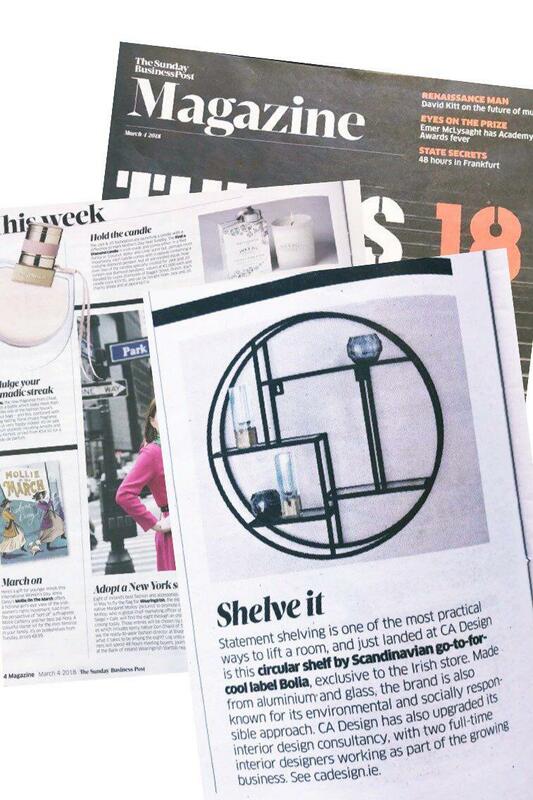 If you didn't get to pick up The Sunday Business Post in 'The Big Thaw'; then you might have missed this lovely piece on our Circular Shelves from CA Design's exclusive NEW Danish brand, Bolia. Bolia is an innovative Danish furniture brand with stores in Denmark, Sweden, Norway and Germany, and a whopping 50 super-talented designers, all crafting seriously lust-worthy pieces for your home. The eye-popping Cloud sofa is already a best-seller at CA Design. Bolia is exclusive to CA Design in Ireland too. The circular shelf allows you to curate your favourite glassware or photo frames and make an elegant wall display anywhere in your home. We absolutely love this as an alternative to plain shelving.